We offer the premium quality Sugar Spheres that are made using the advanced technology to ensure its premium quality. Owing to its premium quality, it is highly used in various pharmaceutical companies. 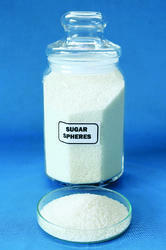 We provide our clients with Sugar Spheres which are made as per the industry standards using high grade ingredients. By our committed efforts, we make sure that only premium quality, highly effective sugar reaches the clients. Sugar Spheres and Jewel sprinkles complement your fine cookies and cakes. Make our lustrous edible pearls and richly hued jewel sugar sprinkles the perfect final touch atop your iced cake or decorated cookies. They'll take desserts to the next level of decoration and visual appeal. Pearls come in 100 gms. packing and 1 Kgs. bulk packing for purchasing. This division is manufacturing neutral pellets, destined fpr pharmaceutical use. Sugar Pellets Definitions:â ¢ SPRAYSPHERESâ ¢ - SS contains not more than 92 percent of sucrose. Calculated on the dried basis. The dried basis. The remainder consists of corn starch as per the European Pharmacopoeia.â ¢ Compliance with Ph. Eur., USP/ NF and JP.â ¢ Produced in accordance with the cGMP. - MB Sugar spheres division manufactures "Neutral Pellets", destined for pharmaceutical use, in compliance with USP, BP, EP since a decade.